DAVOS, Switzerland (Reuters) - From centre-stage in Davos last year, President Donald Trump told the world's corporate bosses that America is a great place to invest. It hasn't quite turned out that way. 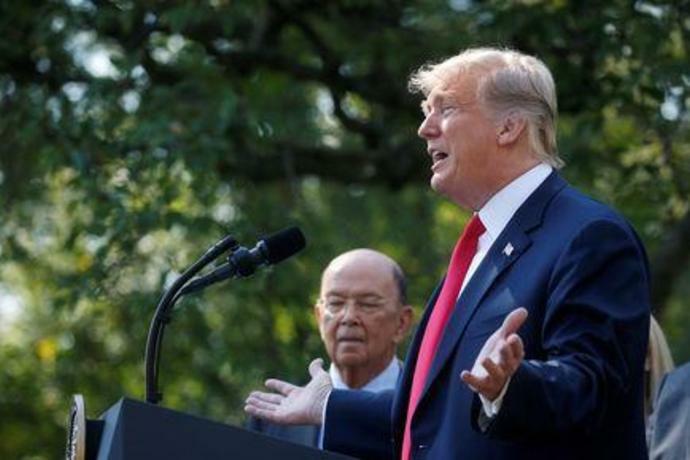 Foreign direct investment to the United States fell in 2018, and companies gathered at the World Economic Forum in the Swiss Alps this year say they are worried Trump's trade war with China will dampen the global economy and business investments even further. One key complaint here this week: Companies increasingly reliant on consumers in China have had to lower their earnings outlooks as the world's second-largest economy cools. And while the U.S. administration has cut taxes and regulations to attract new investment, a wave of caution is rippling through many industries in the United States. "The trade war has been very damaging for the U.S. agricultural economy," said David MacLennan, chief executive of U.S. food and agricultural giant Cargill Inc, which announced worse-than-expected results out of China earlier in January. "The longer this goes on, the worse it is," he told Reuters. Foreign investment in the United States, which includes cross-border mergers and acquisitions and intra-company loans, fell about 18 percent in 2018 from the prior year, according to the United Nations Conference on Trade and Development (UNCTAD). That is close to the 19 percent year-on-year drop in foreign investment globally. But it is notable given the deregulation and tax cuts that might have otherwise fed into inward investment. In January of last year, at Davos, many executives said they planned to spend money in the U.S. in 2018. While the U.N. trade agency attributed the global and U.S. declines to the tariffs that the United States and China have imposed on each other's imports since mid-2018, foreign investment in China actually rose 3 percent last year over the previous year. Foreign investment to India rose 7 percent. Alan Jope, chief executive of consumer goods company Unilever <ULVR.L>, said the United States remains a good market for its products, which include Dove deodorant, Magnum ice cream and Lipton tea. But it is China, where Unilever last year joined forces with ecommerce giant JD.com <JD.O> to move its products around the country, that has become the more resilient market. Jope said China was "one of our most reliable sources of growth. China provides the new stability in consumer consumption." The U.S.-China trade war has hit industries around the world over the past few months. Big Chinese companies such as Alibaba <BABA.N> have shrunk their plans to invest in the United States. Taiwan-based Foxconn <2354.TW> has scaled back its plans for a Wisconsin factory, and Chinese automaker GAC Motor has also delayed a move into the U.S. market. In September, Austria's fibre producer Lenzing halted a planned U.S. expansion, blaming rising tariffs between the United States and China. Chinese textile exports to the U.S. are among the goods facing tariffs. Lenzing mothballed a $322 million project in Alabama to focus on setting up a new production facility in Thailand. To be sure, foreign companies are still investing, particularly in the auto industry. Volkswagen <VOWG_p.DE> said earlier this month that it would invest $800 million to build a new electric car at its plant in Chattanooga, Tennessee. Toyota and Mazda are working on a new assembly plant, and Daimler and BMW are investing in existing operations. But the economic malaise driven by the upending of trade flows is hitting tech companies hard due to both supply chain disruption and the economic slowdown in China. Apple <AAPL.O> this month warned of disappointing quarterly revenues, citing slowing iPhone demand in China. Samsung Electronics Co Ltd <005930.KS>, the world's biggest maker of smartphones and the manufacturer of chips for other smartphone makers including Apple and Huawei, said its fourth-quarter profit likely dropped 29 percent. "For the long run... 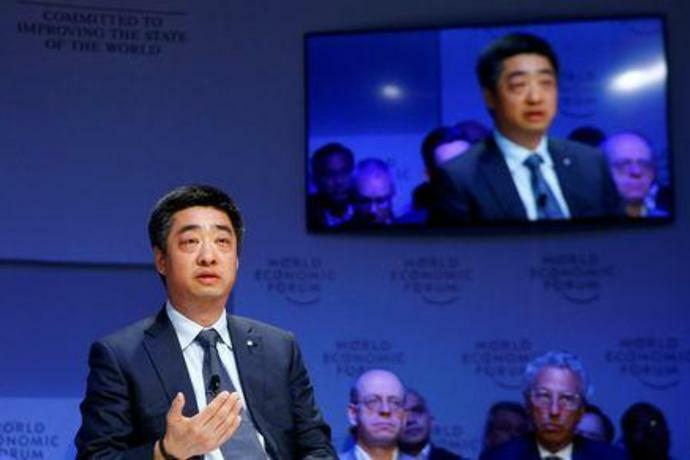 I worry that the trend will expand to many other countries and industries, and at that time... we all will be negatively affected," Ken Hu, deputy chairman of China's Huawei Technologies, said in Davos. Huawei, the world's biggest producer of telecommunications equipment, is "probably suffering the most right now" because it relies on heavily integrated and globalised supply chains, Hu said. As a result of the disruption, Trump's trade war with Chinese President Xi Jinping is looming large over Davos this year, even if neither man is here. The International Monetary Fund trimmed its global growth forecasts on Monday and a survey by auditing and accounting giant PwC of nearly 1,400 chief executives showed increasing pessimism among business chiefs. The PwC research showed 27 percent of executives from outside the United States see the United States as the number one place with the most potential for growth, down from 46 percent in 2018. It's not only economics that is clouding the skies. Foreign companies, mainly Chinese, also face tighter scrutiny when they bring deals to the United States, after the Trump administration last year strengthened the powers of the Committee on Foreign Investment (CFIUS), said Stuart Eizenstat, former U.S. ambassador to the European Union and now head of law firm Covington & Burlington LLP's international practice. CFIUS is an intra-agency panel that reviews acquisitions on national security grounds. Chinese state-owned Sinochem Group, which has been in merger talks with ChemChina to create the world's biggest industrial chemicals firm, said that it did not think it could clinch a U.S. acquisition in the current environment. "You know what's happening today, so I think you will see there will be less investment going abroad," Sinochem Chairman Ning Gaoning said. "The Chinese are getting quite confused. They thought they were welcome to invest in other countries. Now they realize they are not being welcomed all the time." Takeshi Niinami, chief executive of Japanese brewer Suntory Holdings Ltd, told Reuters in an interview that the world has "very big emotional leaders" including one in the Washington. "Davos is a body to work on one voice, to give (a message that says): 'Come on, we have to be rational,'" he said. "Business should be the one to let them cool down." President Donald Trump called the Notre Dame fire "horrible to watch" and said in a tweet: "Perhaps flying water tankers could be used to put it out." "I don&apos;t think Congress, particularly not this group of congressmen and women, are smart enough to look through the thousands of pages," she said. Mueller report: What will it say about the Trump campaign and Russia&apos;s efforts to sway the 2016 election? Why Notre Dame didn&apos;t completely crumble in the blaze. And why it could take decades to repair.